When ordering, please email the floorcloth title, size, and quantity as well as the shipping address and your phone number. 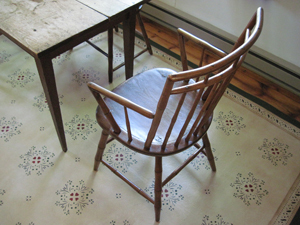 Design Village floorcloths are hand-crafted at our studio in New Jersey. Our floorcloths are made of 100% cotton canvas with non-toxic, environment friendly colors and varnishes. Choose from over hundreds of designs we offer. 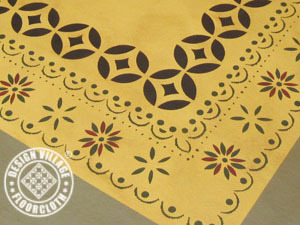 Styles include Historic, Primitive, English Country, Quilt Designs, Floral, French Country, Early American, Southwestern, Geometric Abstract and Contemporary. The Design Village Custom program is geared towards a client who is unable to locate a perfect floorcloth on our website. Design Village will work with inspirations from the fabrics, photos, as well as your suggestions to create several options to choose from. 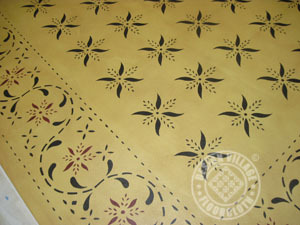 Custom floorcloths range from simple design like a plain geometric pattern to an interpretation of a Matisse painting. 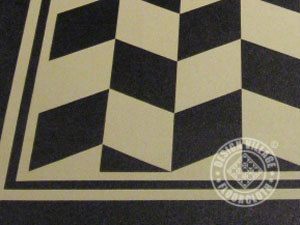 Altering any of the predetermined options such as color matching, non- traditional shapes, or using your own design artwork defines a custom floorcloth. At Design Village we guide you with all the stages of this process. Due to variations in a computer display colors, we recommend requesting color samples before placing your order. Please send $30 for color samples, which will be credited towards your purchase. This does not apply to repeat customers. Select colors from our standard palette or your own that match the decor or artistic vision. Colors marked with * are custom colors in the gallery which may be subject to additional charge. Here are examples of some standard sizes. You may order a floorcloth in a size that do not fit in this chart. Besides our standard sizes listed in the chart above, we can make floorcloths of custom sizes. 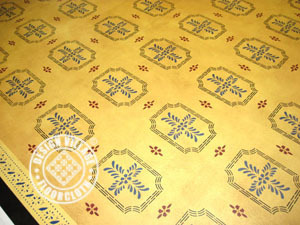 Your floorcloth can be custom made to order. Width Length Rate / Sq. Choose Width 2 feet 2 feet 3 inches 2 feet 6 inches 2 feet 9 inches 3 feet 3 feet 3 inches 3 feet 6 inches 3 feet 9 inches 4 feet 4 feet 3 inches 4 feet 6 inches 4 feet 9 inches 5 feet 5 feet 3 inches 5 feet 6 inches 5 feet 9 inches 6 feet 6 feet 3 inches 6 feet 6 inches 6 feet 9 inches 7 feet 7 feet 3 inches 7 feet 6 inches 7 feet 9 inches 8 feet 8 feet 3 inches 8 feet 6 inches 8 feet 9 inches 9 feet 9 feet 3 inches 9 feet 6 inches 9 feet 9 inches 10 feet Choose Length 5 feet 5 feet 3 inches 5 feet 6 inches 5 feet 9 inches 6 feet 6 feet 3 inches 6 feet 6 inches 6 feet 9 inches 7 feet 7 feet 3 inches 7 feet 6 inches 7 feet 9 inches 8 feet 8 feet 3 inches 8 feet 6 inches 8 feet 9 inches 9 feet 9 feet 3 inches 9 feet 6 inches 9 feet 9 inches 10 feet 10 feet 3 inches 10 feet 6 inches 10 feet 9 inches 11 feet 11 feet 3 inches 11 feet 6 inches 11 feet 9 inches 12 feet 12 feet 3 inches 12 feet 6 inches 12 feet 9 inches 13 feet 13 feet 3 inches 13 feet 6 inches 13 feet 9 inches 14 feet 14 feet 3 inches 14 feet 6 inches 14 feet 9 inches 15 feet Choose Price Group Group A - $25 / sq. Group B - $30 /sq. Group C - $35 /sq. Group D - $40 /sq. Note: The sizes and rates listed are for the finished floorcloths after hemming. Some merchants may charge for the floorcloth prior to hemming, which may add up to 15% to your cost. 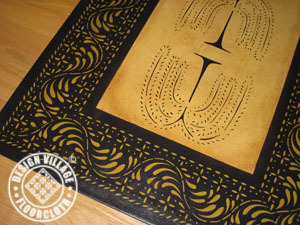 For custom designs please include $90.00 non-refundable design fee, which is credited towards your purchase. There is no design fee if you select one of our standard design. You may pay by check, money order, or we accept credit card payment through PayPal. You don't need to have a PayPal account to pay via PayPal. Since all work is made to order, it is subject to prepayment. A 50% non-refundable deposit is required to confirm orders with the balance due before shipping. Please do not send credit card info via email. Delivery time depends on the size of the floorcloth and the amount of work we have at the time the deposit is received. Due to the fact that each floorcloth is hand crafted to order, and each one is a one of a kind, please expect slight variations. Also, with this in mind, please expect 3 to 4 weeks and a little longer during busy months to complete your heirloom. Please place your holiday orders well in advance to avoid disappointment. We do not accept rush orders - we do not compromise the quality. Floorcloths will be shipped rolled in a box or tube. The shipping charges includes insurance. We use UPS Ground. In case the package is damaged please do not accept the shipment and notify us immediately, so that we can take up the issue with UPS. Custom floorcloths are specially designed and created for you and therefore there are no refunds or exchanges on custom orders. If you decide to return a stock order, we will be happy to help you through the return process. 1. Obtain a Return Authorization (RMA) number by email within 2 business days of receiving the product. 2. Ship the product within 5 business days of the date of issuance of the RMA to the address that we give you. 3. To receive a refund or credit, your purchase must be returned in original condition with shipping and insurance pre-paid in "as new" condition, in original box and packaging. Any variance from these conditions could result in a delay or reduced refund. 4. All products will be subject to a 20% restocking fee. Shipping fees will not be refunded. 5. Refunds on purchases made with a credit card will only be credited to the same card. 6. Refunds or credits are issued after receipt and inspection of returned goods. 7. Products ordered and then refused by a customer at their address or returned without contacting us for a Return Authorization Number will incur an automatic 20% re-stocking fee and shipping fees.